It was never going to be an easy ride for broadcasters to transition from legacy SDI systems to a completely virtualized IP environment. But with an industry standard now squarely in place, vendors say their focus has shifted to giving broadcasters a smoother one by refining the user experience. That comes down to integrating devices from multiple vendors and automating processes. Compression of heavy data loads remains an industry concern, as does the security of uncompressed data. Further on the horizon, vendors see metadata as an important center of activity. Broadcasters are beginning to feel more comfortable about the IP transition, says Ciaran Doran, EVP of sales and marketing at Pixel Power. They know the “vendors will converge to that standard over time. For some elements of that standard, they will converge faster than others,” and geography will be a factor in what elements are prioritized. The transition may ultimately take a decade, but vendors say they have made significant progress since the December 2017 ratification of the ST 2110 standards. The core ST 2110 set of standards for reliably moving data over networks “appears to be solid,” says Chuck Meyer, CTO production for Grass Valley. The industry is grappling with compression issues because of the data load necessary to deliver better and bigger imagery, Button says. Compression is “not difficult,” but the industry needs an agreement, he says, adding he expects to see one within the next year. Plug-and-play behavior, or improving the user experience by easily integrating devices from multiple vendors, is a focus, says Andy Warman, director of playout solutions at Harmonic. “That’s going to make it so much easier to operate” — and expanding and contracting systems at events — a “much easier proposition” for system engineers. It will be even more important as operations scale, he adds. Because of the move to a virtualized workflow, security for dealing with uncompressed data requires scrutiny, Warman says. He echoes the need for cybersecurity, saying the company is “developing our own security in the media path” because no current system on the market can do that and meet Aperi’s low-latency requirements. At the same time, the security of continuing operations in the face of hardware problems is also important, he says. Aperi plans to show a self-healing system during the NAB Show in April, he adds. NewTek is seeing “a lot of movement” from customers who are “trying to deploy virtualized workflows for things like video editing,” says Brian Olson, VP of product management, NewTek. The draw for virtualization is the economy of video editing in the cloud and accessing that work from any workstation in the enterprise, he says. ST “2110 is not necessarily easy to implement,” Olson says. 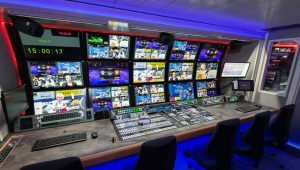 A traditional SDI facility might want to take advantage of IP for its flexibility and scalability and its compatibility with new media workflows, he says, but budgets may be an issue. Live production gear is the hardest part to virtualize, Olson says, but NewTek is working on a proof of concept around that with various customers. The industry is “well on its way in the transition to IP,” says Mo Goyal, senior director, international business development, live media production at Evertz. The company has already carried out more than 400 installs, including the greenfield Telemundo facility. The challenge is leveraging the benefits of the IP structure while keeping the system easy and simple to use, Goyal says. Once ST 2110 was ratified, “almost immediately we started to see orders coming in,” says Steve Reynolds, president, playout and networking solutions at Imagine Communications. The company spent much of 2018 designing to the ST 2110 standards and moved into implementation phases later in the year, he adds. A number of those large projects are already live or in the final stages of completion and commissioning. 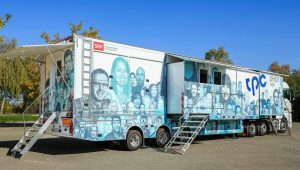 One is the outside broadcast truck, UHD1 HDR, for which Imagine provided the IP-connected infrastructure. 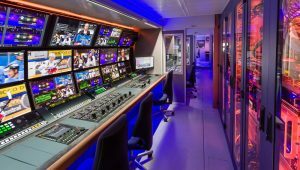 Built for Swiss production company tpc, its first live broadcast was a match in the Swiss National Hockey League in Zürich in October. IP-based production “represents a level of configuration and automation we’ve never really seen before in the industry,” and a lot of what the company has learned in the last year lies in how to implement the technology. For example, production engineers in an SDI environment are familiar with a cross-point router represented by source and destination wires. The production engineers tended to think of cameras as sources and recording devices as destinations. But IP traffic runs through an IP router. For the truck built for tpc, Reynolds says, “we had to create virtualized tie lines to explain to the production engineers what was happening inside the truck” in relation to virtual mapping.